Just A Car Guy: train bridge inspections might just get the tech advancement they've needed for better analysis and instant problem reporting... sensors. train bridge inspections might just get the tech advancement they've needed for better analysis and instant problem reporting... sensors. According to the American Society of Civil Engineers’ 2017 study, 40% of U.S. bridges are 50 years old or older. At Union Pacific, more than 95 percent of the company’s roughly 18,000 bridges are inspected a minimum of twice annually by a specially trained two-person bridge inspection team. Bridges fewer than 10 years old and without defects are inspected once annually. 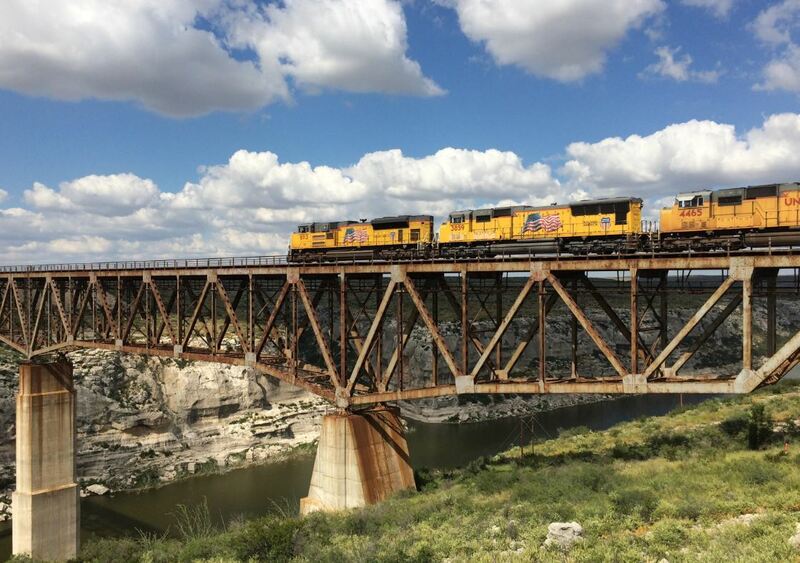 Union Pacific currently is working with three partners, 2 of which are universities’ Engineering Schools on bridge monitoring projects. “Universities by nature do a lot of research and collaborate with vendors; our partnerships could lead to huge benefits,” Martindale said. The goal: An easily deployable, cost-effective solution to supplement in-person inspections, which carefully examine bridge components for cracks or other defects. At the University of Nebraska, postgraduate students are using sensors to collect data from steel bridge members, using as the guinea pig a UP bridge in Columbus, Nebraska, built in 1908. The University of Michigan is working on a similar project, partially funded by a U.S. Department of Transportation grant. Students set up strain gauges on two Union Pacific bridges near Memphis, Tennessee. The devices send data through a wireless network back to the university, where researchers collect and analyze it. They’re focused on how loads, such as the weight of a train or wind, impact bridge components and cause fatigue.